The Hurrians (or Khurrites) were neither Semitics nor Indo-Europeans, but their origins are obscure. They appear to have emerged between 2500-2000 BC, probably from the Caucuses mountains to the north, to occupy the upper Tigris Valley and the upper Euphrates (close to the Assyrians), which had previously been the centre of the Chalcolithic Halaf culture. The end of the Akkadian empire enabled them to gain control of regions of northern Mesopotamia towards the end of the third millennium BC. They were able to found a small, nebulous state in Urkesh (modern Tell Mozan in Syria), in the foothills of the Taurus Mountains, and in Nawar (or Nagar, now Tell Brak in Syria) in the northern Khabur Valley, and another in Arrapha. 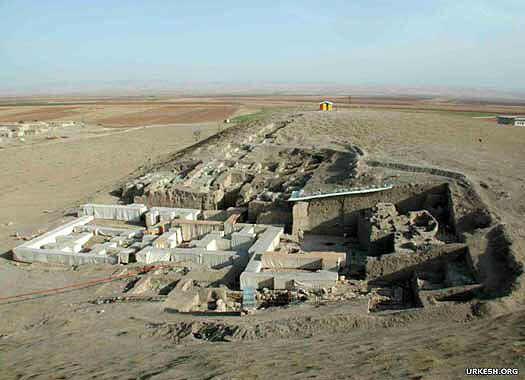 Urkesh seems to have been inhabited since around 5000 BC, as confirmed by archaeological discoveries of human remains there, and an urban settlement was founded in around 2900 BC. The heartland of their settlement area, it was only in Urkesh, Nawar, and Arrapha that the Hurrians had a majority population, but settlements of Hurrians could be found spread across much of northern Mesopotamia. They also later migrated southwards into Babylonia, and westwards into Hatti and Kizzuwatna in Anatolia. Once in Anatolia, they may have been influenced by the Indo-European Luwians or Hittites, as the storm god Teshub was patronised by them. Luwians chiefly worshipped Teshub - 'Tarhun' in their language - but this was rendered as 'Tarhunta' in theophoric names. Teshub or Tarhun stands out as being another contraction of 'tu arun', meaning 'your protector'. Other pronunciations of this asura god are Varuna, Ouranos, Taranis and, of course, the Germanic contracted form of Thor. This presence of an asura in an Anatolian branch of Indo-Europeans is intriguing. Either the cult was borrowed (from the Hurrians perhaps? ), or the god is so old that it dates back to a time in which all branches of IEs were in contact with one another - ie. somewhere around a date of 4000-4500 BC at the latest. The recently-arrived Hurrians found the small state (or states) of Urkesh and Nawar, based on the two cities of the same name in northern Mesopotamia. Nawar seems to fall under the control of the Akkadian empire for a period, with the city serving as an administrative centre. The names of five of the kings of Urkesh and Nawar are known for this period, but there are certainly others whose names have been lost. Uniquely, the people of Urkesh use the term 'endan' to refer to the early kings. The daughter of Naram-Sin, king of Akkad, Tar'am-Agade, marries a king of Urkesh who may possibly be Tupkish. Akkadian influence becomes noticeable in Urkesh and the king builds a palace in the city. Endan of Urkesh. Reigned after the successor of Tupkish. Ishar-Kinum's name is only rediscovered by archaeologists in 2004, from a freshly uncovered seal inscription. Son. Lugal of Urkesh & Nawar. Hurrians found the small state of Arrapha (modern Kirkuk) in northern Mesopotamia at around the same time as they adopt Akkadian cuneiform script for their own language. The new Amorite rulers of Mari subdue Urkesh, making it a vassal state. However, the locals do not submit easily, and letters sent back to Mari attest to a strong sense of resistance against foreign rule. Amorite vassal king of Mari. Urkesh is made a vassal of the kingdom of Upper Mesopotamia, but following its break-up, the city regains its 'freedom'. Hurrians also begin migrating west in this period, where they can be found in cities such as Alakhtum. In all likelihood, Mari renews its control of Urkesh until its own fall. Does Urkesh re-establish its own independent kingship afterwards? A Hurrian king, but city unknown. King Arioh of the Bible. Hurrians invade the Old Hittite empire several times, and campaign southwards, perhaps pushing refugees from Syria and the Levant into Egypt where they form the Hyksos peoples. The region is fought over by Yamkhad and the Hittites, But following the collapse of Yamkhad and the decline of the Hittites shortly afterwards, Hurrian migrations into Syria and Anatolia increase. Following the collapse of Babylonian regional power, the Hurrian state of Mitanni emerges as a major power which entirely dominates the region. Urkesh is abandoned around this time. Nawar falls to Assyria, along with Mitanni.